Chrichton's World: Review Blade (1998): Still awesome! Review Blade (1998): Still awesome! By accident I saw a clip of Blade on Youtube and it made me want to watch it again. I think I must have seen it at least ten times since it was released and it has not lost any of it's strength. It's just as good as the first time I saw it. Wesley Snipes as Blade is excellent. Every move he makes is stylish and badass. If I were a vampire I would think twice to cross his path. Snipes plays his role very seriously but does not hesitate to give Blade some sense of humour. At times it might seem like he is cold hearted and that he is more vampire than human but it's quite the opposite. It's a real joy to see Snipes in action as he kicks and slays vampires like it's nothing. Even today the action scenes are thrilling and exciting. And one element that contributes to this excitement is the soundtrack. There are some real banging tunes in this film that will get your heart pumping. Now Blade does have some flaws. The story is incredible simple and I do feel that some characters could have been fleshed out a little more. Whistler is an important character but he is not given that much to do. I like Kris Kristofferson and I think he definitely has a presence that demands attention. As the designated father figure it would have been a whole lot more compelling and nice if Blade and Whistler had more interactions with each other. I also would have liked to see more about the vampires and their hierarchy. The higher ups certainly don't respect the lower ranks as much and yet they are terrified of one in particular named Deacon Frost (Stephen Dorff). Why is that? Surely these elders who are born as vampires should be more powerful than the ones who are turned like Deacon? And yet once challenged they hardly put up a fight. Certain scenes especially the ones before the finale feel like padding. They take too long to get to the point. I guess they wanted to amp up the tension and build up some suspense. It wasn't necessary since at this point you already knew what was going to happen. BTW Blade's reaction to Deacon during the end fight is priceless. Here we have a hero who was on top of everything like a champ and even he can't believe his eyes. It's little reactions like those that give Blade a lot of personality. 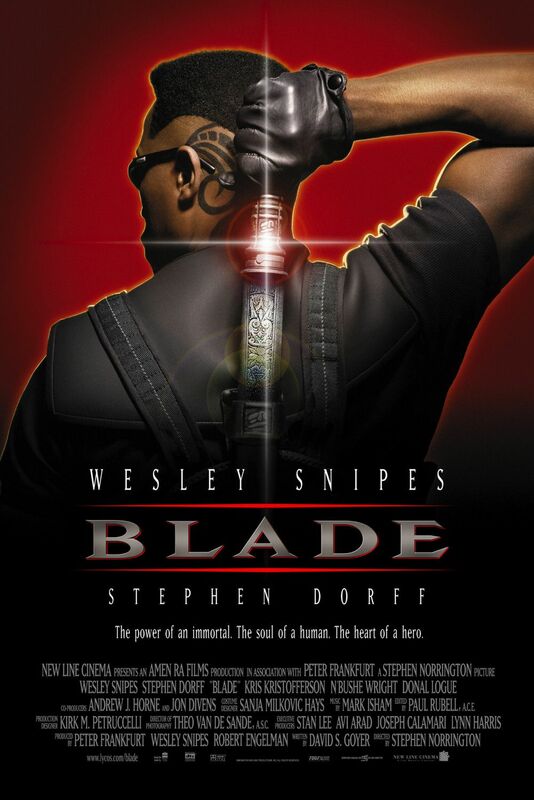 Overall I can say that Blade is still awesome today and is a true classic that can be enjoyed over and over again.